I have loved Precious Moments as long as I can ever remember! Their soft colors and tear drop eyes are adorable. Precious Moments has a new book that is, well, precious! 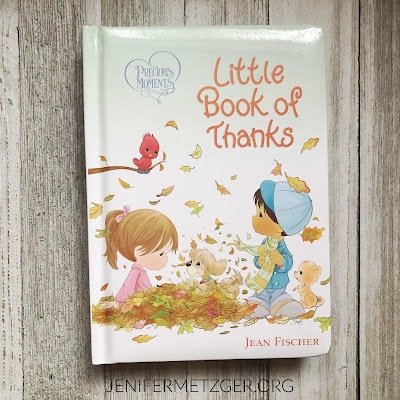 The Precious Moments Little Book Of Thanks is a board book that any little one will enjoy. While the book is about giving thanks, I don't think it is limited to Thanksgiving! We need to teach our children to give thanks all year round, and this book does just that. 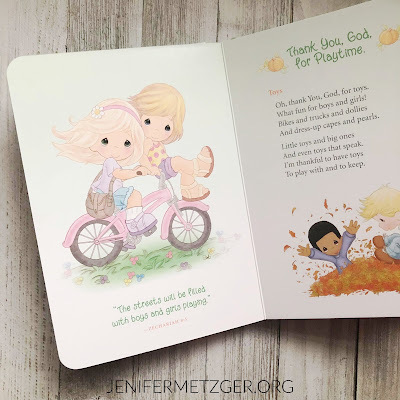 Precious Moments Little Book Of Thanks is collection of verses, rhymes, and prayers as it teaches kids to give thanks for everything, even those little things in life. To purchase a copy of Precious Moments Little Book Of Thanks, click below. To enter to win a copy, complete each task in the rafflecopter below. My dad had quite a bit of them that he regularly purchased from one of his clients. My children loved to play with them, but I don't have a favorite. Yes, I have seen the Precious Moments figurines before. The Broken heart is my favorite Precious Moments figurine.